OW&R is home of the Buffalo, a glorious beast. This is where you find the finest wings, bold burgers and tasty, chopped in-house salads. We’re home to great food, no bull. 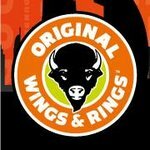 At OW&R, we love everything about wings. So, we made a promise way back in ’84, when we served our very first wing, to give America the absolute finest wings, along with more sauce combinations and heat levels than ever beforeseen.